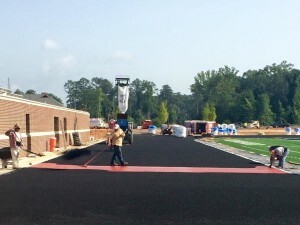 A new Rekortan M99 running track is in process at Berry College, Mt. Berry GA. Rekortan M99 is the first choice of elite runners and is the same surface featured at the Penn Relays. The surface is being installed by APT partner, Sports Turf. Stay tuned to APT’s news feed and Facebook page to watch the progression of the track at Berry College, as well as other exciting photos and news on this season’s sports projects!